Most people are working to pay down something: a mortgage, a credit card balance, a car note. There’s another kind of debt, too — an account that’s fallen behind. Back taxes, child support, an old cellphone bill. They’re called delinquencies. They can wreck a credit score and stick around for years. 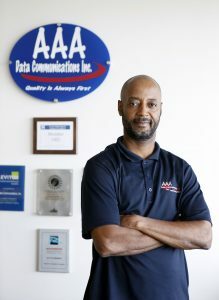 AAA Data Communications in southern Dallas is a quiet place to work. Angelo Collins likes it that way. He’s alone in a small office filled with boxes. Inside each one are validators for Dallas Area Rapid Transit busses. They’re basically wireless “easy-pay consoles” for riders to use. Collins programs each one, downloading software and repacking the box once the device is ready to go. It’s a full-time job with benefits that pays $18 an hour — money Collins is grateful to have. He’s working to become debt free after getting divorced last year. “I had to kind of regroup myself and mentally prepare myself to put things back in order,” he said. Collins has two teenagers. He and his wife were separated for several years before the divorce was finalized. Child support bills piled up while he worked and went to school. In 2014, he took on a full course load studying electronics and telecommunications. “I just concentrated on school for that one year, so that kind of dropped me, put me back on child support,” he said. Collins fell $6,000 behind. He’s back to making payments now, but hates the pile of debt with his name on it. He illustrates his point by standing a pen on top of his desk, and dragging it slowly across the surface. His financial coach at Catholic Charities Fort Worth is helping him chip away at that mountain, so it’s a little easier to pull. Alisha Wilkinson is a case manager with Catholic Charities and says many clients are working on accounts that are past due. Many folks who go to Catholic Charities are just like Collins — people trying to catch up on child support, which doesn’t stop accruing when someone fails to pay. The Texas Attorney General’s Office handles 1.5 million child support cases. In 2015, $4.55 billion in current support was due — that doesn’t include delinquent payments. About $1.5 billion, or 35 percent, wasn’t paid. Wilkinson says one of her clients is paying child support — and his child has children. Old child support is one of those debts that’s inescapable. If someone’s employed, wages can be garnished. Depending on how many kids are involved, up to 50 percent of a salary can be diverted to pay child support. Tax refunds and Social Security income count, too. “You might attack the biggest of the most persistent debts, and then after getting a handle on those, you can turn your attention toward other debts to manage,” Wilkinson says. Wilkinson says some of those debts like an unpaid cable bill, old parking tickets or an overdrawn bank account will fall off a credit report in seven years. Others won’t — especially if a collection agency decides to sell a debt to a new company. “Ten plus years could pass and you think that it might be off of your credit report by that time, but because new creditors are continuing to pursue this debt, it will remain on your credit report and remain active,” Wilkinson says. Collins just settled an outstanding bill with Verizon. He’s brought that child support balance from $6,000 to $2,000. He’s also chipped away at $10,000 of credit card debt, with only $2,300 left to pay off. It’s an important step toward becoming debt-free and free of the burden that comes with owing money you don’t have. He’s looking forward to a day when his mountain of debt is just a memory. For the past month, KERA’s series One Crisis Away: Drowning In Debt has focused on everything from credit cards to child support — and the ways many North Texans are struggling to stay on top of what they owe. Courtney Collins reported these stories. She sat down with Executive Producer Jeff Whittington to recap the series.